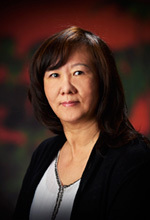 Dr. Liu is a professor of pathology at the University of Utah School of Medicine. Dr. Liu received her MD from Beijing University of Chinese Medicine and her MS in pathophysiology from Peking Union Medical College. She completed AP/CP residency training at Drexel University College of Medicine, a fellowship in hematology at Drexel University College of Medicine, and an oncologic/surgical fellowship at Memorial Sloan-Kettering Cancer Center. Dr. Liu is an AP/CP and hematopathology-boarded pathologist. Her current research interests include oncologic clinical research.